The beautiful Hever Castle, situated in the lovely Kent countryside in England, dates back more than 700 years but was lovingly restored in the early 20th century by William Waldorf Astor, a wealthy American. The oldest part of this charming castle was built in about 1270 and was owned by William de Hever, a Sheriff under King Edward I. This medieval castle was made up of a huge gatehouse and walled bailey which were surrounded by a moat, for defence, and entered by a wooden drawbridge. When the “Bullen” family took control of the castle in the 15th century, they added a Tudor house inside the castle walls. Sir Thomas Boleyn, inherited Hever Castle from his father Sir William Bullen in 1505 and made it into a family home for his wife, Elizabeth Howard, and three children – Mary, Anne and George. 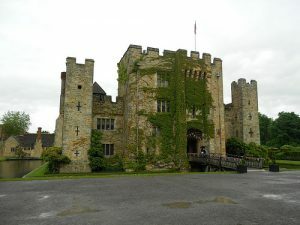 Anne retreated to Hever Castle when Henry first started wooing her, fought off sweating sickness there in June 1528 and was sent there in autumn 1528 when Cardinal Campeggion, the Papal legate, came to England to preside over the legatine court. 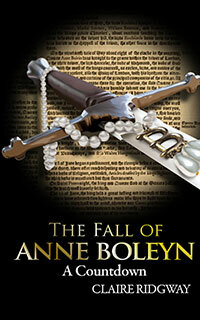 After Thomas Boleyn’s death in 1538, the castle fell into the hands of Henry VIII. He gave it to his fourth wife, Anne of Cleves, when he divorced her in 1540. Anne of Cleves lived at Hever Castle as “The King’s Sister” until her death in 1557 when it was bought by Sir Edward Waldegrave.